Murrysville, Pennsylvania (CNN) — High schooler Mia Meixner was tending to her locker at the start of her day when a ruckus behind her got her attention. Two boys were scuffling on the floor. Nothing to worry about, she thought — until she saw one of them lift his shirt, and blood gushed out of his stomach. In the next five minutes, police say, the boy went from classroom to classroom at Franklin Regional Senior High School, swinging two kitchen knives. He wounded 20 students and a security officer before the assistant principal tackled him. Police later identified the teen behind Wednesday’s attack as 16-year-old Alex Hribal, and charged him with four counts of attempted homicide, 21 counts of aggravated assault and one count of possession of a weapon on school grounds. They said he’ll be tried as an adult. “He’s actually been a really nice kid,” Meixner said in disbelief. He was kind of withdrawn, didn’t have many friends and “kept to himself,” she said. Murrysville, with a population of about 20,000, is a quiet middle-class enclave roughly 20 miles east of Pittsburgh on U.S. Route 22. Before what was happening could sink in, Meixner noticed a girl near her extending her arm. It was bleeding. “I dropped my books, and I ran over and asked if she needed help,” she said. She offered to take her to the school nurse, but then the rumble of stampeding students echoed at her from down the hall. “I heard them screaming, ‘Get out; run; he has a knife! '” she said. A teacher told her to hand off the wounded student and run outside. “At that point I ran out of the school,” she said. Meixner remembered watching the news of the Sandy Hook Elementary School shootings, but that seemed so far removed. She thought something like it could never happen in her school. “It feels really surreal,” she said. Students standing outside the school heard its fire alarm go off. That probably helped get more people out of the school during the evacuation order, Police Chief Thomas Seefeld said. Students were running everywhere, and there was “chaos and panic,” he said. Student Matt DeCesare saw two students come out of the school covered in blood. Then he saw teachers running into the building and pulling “a couple of more students out,” he said. The students had been stabbed. “We all took our hoodies off and handed them to the teachers to use as tourniquets to stop the bleeding,” DeCesare said. On Thursday, Seefeld praised faculty members for their reaction. Police meet with them often, he said, and the school has plans in place to react to violence. “It all came together,” he said. Investigators have finished collecting evidence in the school he said. “The crime scene was quite bloody.” About 50 officers from the FBI and local law enforcement agencies had worked on the case, he said. Officials also mentioned that the school is outfitted with surveillance cameras and metal detectors. Hribal couldn’t seem more normal, the way his lawyer describes him. “He’s a typical young kid. He’s a B+ student. The family is like Ozzie and Harriet. They have dinner together every night,” said his attorney, Patrick Thomassey. “All the students liked him,” Thomassey said. “He worked well in groups, and this happened. So there’s a reason for it — that’s what I’m saying. And we have to get to the bottom of that,” the attorney said. In one point, his description of Hribal differed from Meixner’s. Thomassey said his client wasn’t a loner. He also downplayed the notion that his client had been bullied. He also did not seem to embody the cliché of digitally connected youth. According to Dan Stevens, the county deputy emergency management coordinator, Hribal had a very minor Facebook presence and didn’t have much experience on Twitter. Thomassey said he would file a motion to move the case to juvenile court. And he wants a psychiatrist to evaluate him. “I’m not sure he knows what he did, quite frankly,” Thomassey said, adding that Hribal feels remorse. “He’s scared. He’s a young kid,” the attorney said. Hribal is being held without bail at the Westmoreland County juvenile detention center. He was treated for injuries to his hands, police said. Authorities have not detailed a possible motive in the attack. A search warrant has been served on the Hribal’s home, public safety spokesman Stevens said. The suspect’s cell phone was seized along with his computer and his parent’s computer. On Wednesday, at least a dozen FBI agents could be seen going in and out of Hribal’s family home in the hours after the attack. Shortly before the agents arrived at the house, a man believed to be Hribal’s father drove up. 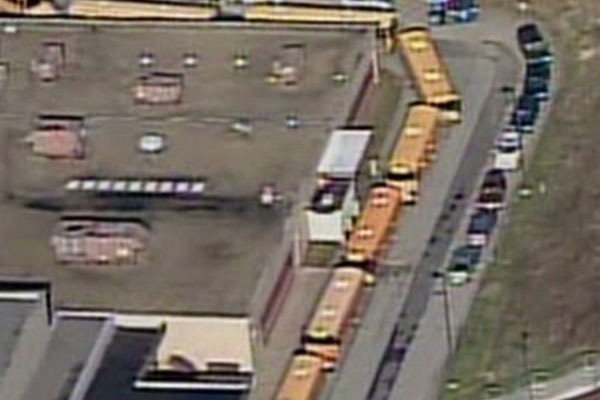 The students who were hurt range in age from 14 to 17, emergency coordinator Stevens said. The injuries were stabbing-related, such as lacerations or punctures. Four victims were in critical condition Wednesday, including one who was “eviscerated” and may not survive, Peck said. A doctor who treated six of the victims, primarily teens, said at first they didn’t know they had been stabbed. “They just felt pain and noticed they were bleeding,” said Dr. Timothy VanFleet, chief of emergency medicine at the University of Pittsburgh Medical Center. The school said that half a dozen prayer vigils were held overnight, and counseling services are being arranged for students.